The Lord Chancellor declared in the House, "That there was a Writ issued under the Great Seal, for the proroguing the Parliament." 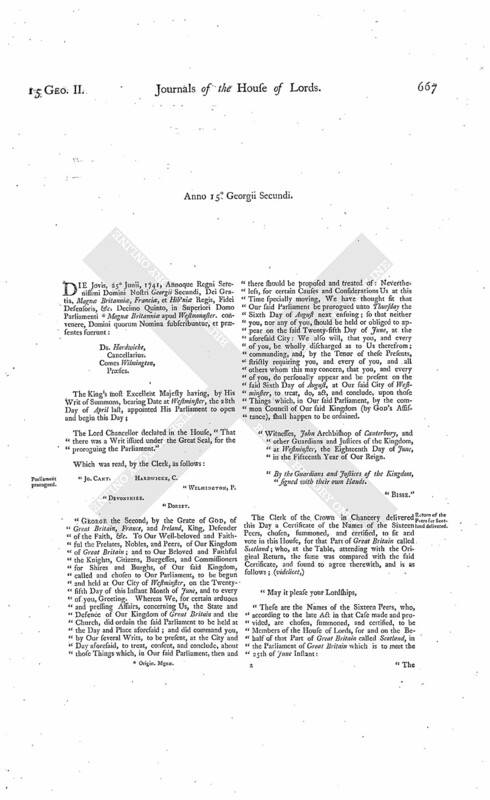 "George the Second, by the Grace of God, of Great Britain, France, and Ireland, King, Defender of the Faith, &c. To Our Well-beloved and Faithful the Prelates, Nobles, and Peers, of Our Kingdom of Great Britain; and to Our Beloved and Faithful the Knights, Citizens, Burgesses, and Commissioners for Shires and Burghs, of Our said Kingdom, called and chosen to Our Parliament, to be begun and held at Our City of Westminster, on the Twentyfifth Day of this Instant Month of June, and to every of you, Greeting. Whereas We, for certain arduous and pressing Affairs, concerning Us, the State and Defence of Our Kingdom of Great Britain and the Church, did ordain the said Parliament to be held at the Day and Place aforesaid; and did command you, by Our several Writs, to be present, at the City and Day aforesaid, to treat, consent, and conclude, about those Things which, in Our said Parliament, then and there should be proposed and treated of: Nevertheless, for certain Causes and Considerations Us at this Time specially moving, We have thought fit that Our said Parliament be prorogued unto Thursday the Sixth Day of August next ensuing; so that neither you, nor any of you, should be held or obliged to appear on the said Twenty-fifth Day of June, at the aforesaid City: We also will, that you, and every of you, be wholly discharged as to Us therefrom; commanding, and, by the Tenor of these Presents, strictly requiring you, and every of you, and all others whom this may concern, that you, and every of you, do personally appear and be present on the said Sixth Day of August, at Our said City of Westminster, to treat, do, act, and conclude, upon those Things which, in Our said Parliament, by the common Council of Our said Kingdom (by God's Assistance), shall happen to be ordained. "Witnesses, John Archbishop of Canterbury, and other Guardians and Justices of the Kingdom, at Westminster, the Eighteenth Day of June, in the Fifteenth Year of Our Reign. "By the Guardians and Justices of the Kingdom, signed with their own Hands. Return of the Peers for Scotland delivered. 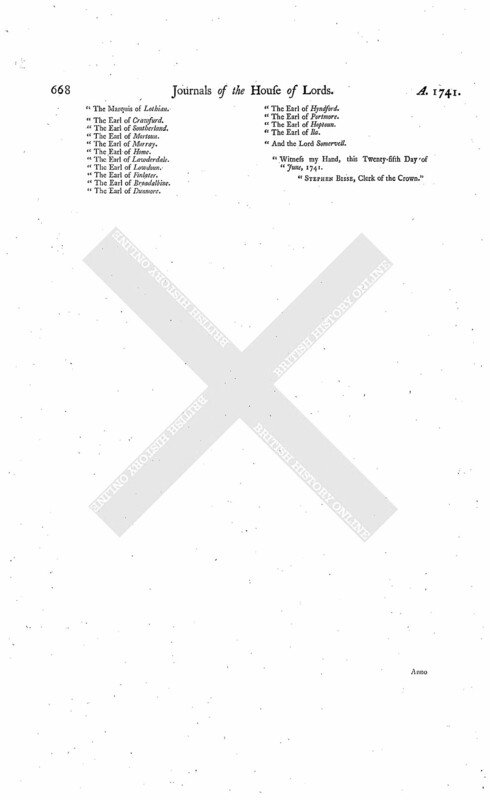 "Witness my Hand, this Twenty-fifth Day of June, 1741. "Stephen Bisse, Clerk of the Crown."